Terminologically blurred, distinctions between "sound art" and "music" have been rendered largely irrelevant as the digital apparati underpinning the very fonts of sonic creation have become ever so entrenched. Though recent micro-movements within electronic music's gradually widening circles embrace analog fetishism and retro/vintage gear as a means from which to derive inspiration, those who rely on pure ideation and artistic will rather than established dogma often achieve more startling, and longer-lasting, results. Labels such as Monotype, Staubgold, & God Records (the latter two responsible for the original vinyl issue of Instrumentarium), act as ideal expressionist sieves through which many avanteers filter their own senses and sensibilities. Outsider digitalist Boris Hegenbart holds such principles close to his chest, as does the 19 colleagues that aid and abet him in the realization of Instrumentarium's collection of awry constructs and frayed, wiry tone poems. The list of collaborators here are truly legion: Fred Frith, David Grubbs, Michael Vorfeld, Bernhard G�nter, Oren Ambarchi, Boris Hauf, Martin Brandlmayr, and a gaggle of others read like a who's who of adjunct aural designers, fleshed out across multiple disciplines, timeframes, aesthetics, and soundspans. Track lengths for each of the eighteen pieces on hand here are economical for the most part, but don't let their brisk durations fool you: Hegenbart's subsequent warping and mastication of the "sample food" provided by his cohorts, either in real-time or stripped out of the broadband ether, demonstrates a savvy for composition and production that mirrors the same editorial acumen possessed by the likes of Teo Macero. 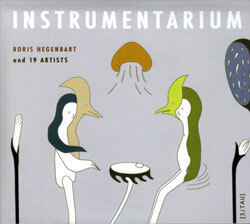 Rui Eduardo Paes's liner notes discuss connections made between the technological intricacies and foils of dub and what Hegenbart has accomplished on Instrumentarium, and though such allegations are tenuous at best, many of the pieces here do reflect the ethos found at the venerable mixing desk. Certainly an argument could be made for the dubwise motifs expanded across the galvanizing three-minute glitchbeat groove Hegenbart carves out with fellow tool-and-die maker Oren Ambarchi, or the strangely glistening afterglow that Marc Weiser and Hegenbart wrap around the breadth of their taffy-esque curdle, as bass pulses purr and errant noises shimmer vibrantly before evaporating. Just but two examples of the kind of sensorial colorations Hegenbart expertly commands, the ingredients of which inform one of the most fascinating, versatile, and important recordings of recent memory.